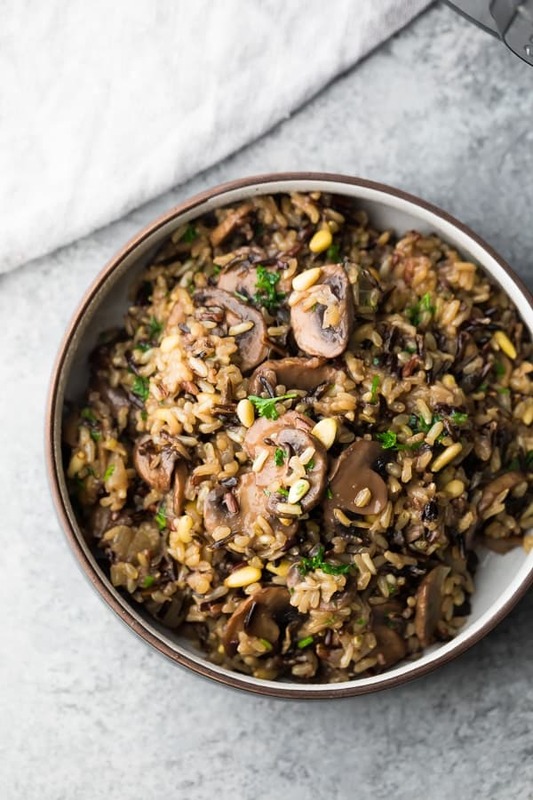 Instant Pot wild rice pilaf with mushrooms and pine nuts- this is the perfect low-effort side dish for your holiday table! Cook it ahead in the Instant Pot and re-warm when you’re ready to serve. Gluten-free and vegan! Easter is just around the corner, and I have the perfect easy side dish for you! 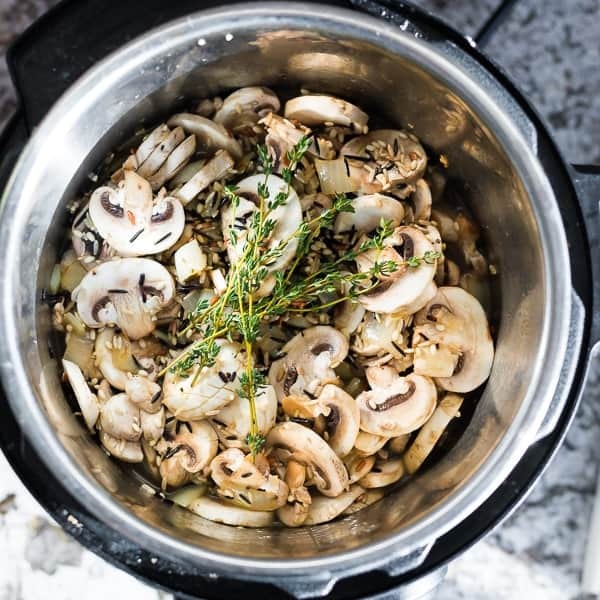 To save your stove-top, you can prep this Instant Pot wild rice pilaf with mushrooms & pine nuts in the Instant Pot! Bonus? It can be prepped a day or two ahead and re-heated. How’s that for convenient? This super simple wild rice pilaf recipe is not the star of your table, but it’s a flavorful side dish that is *just* fancy enough for a holiday feast. And did I mention? So. Flipping. Easy. If you are anything like me, you spend most of your time on the main star of the holiday feast…ie the turkey or the ham, or the goose. Side dishes pretty much need to be effortless, and that’s just what this Instant Pot wild rice pilaf is! You barely have to do any work, and you can even make it ahead! What on Earth is wild rice pilaf? Wild rice pilaf is basically just wild rice cooked with a bunch of yummy stuff: onions, garlic, stock, thyme leaves and mushrooms, in this case. First we sautee some onions and garlic in olive oil. Then we add the wild rice and toast it for a few minutes. Then we deglaze the pan with a little white wine. Cook it up with stock, thyme leaves and mushrooms. Voila! Delicious, super-flavorful rice that is the perfect side dish for your holiday feast. 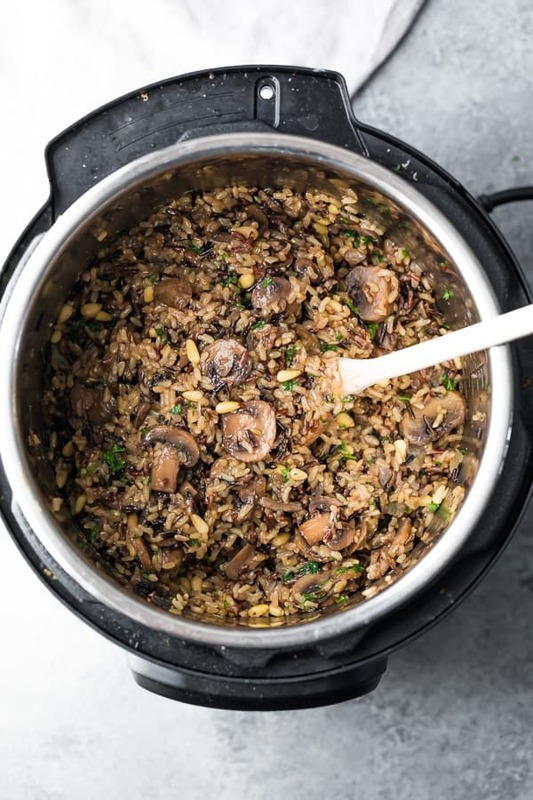 Not only is this Instant Pot wild rice pilaf super easy to make, but you can even make it ahead and re-heat. I tried a few different re-heating methods. 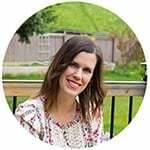 Lorena from Green Healthy Cooking suggests re-heating in the Instant Pot using a pot in pot method, steaming it for 5 minutes. This is super efficient, and great for a half batch of this recipe but I didn’t have the right size bowl to do a full batch of this pilaf. I suggest piling everything into a casserole dish, covering, and re-heating in the oven on 350°F if you are making a full batch of this Instant Pot wild rice pilaf. Add the pine nuts and parsley fresh! Looking for more holiday side dishes? Try this Parmesan Mashed Cauliflower, or this Raspberry Balsamic Cranberry Sauce, or check out this round up with 27 Holiday Slow Cooker Recipes! Watch the video below to see exactly how I prepped my Instant Pot Wild Rice Pilaf. It’s so easy! You can find more of my recipe videos on my YouTube channel, or on Facebook. 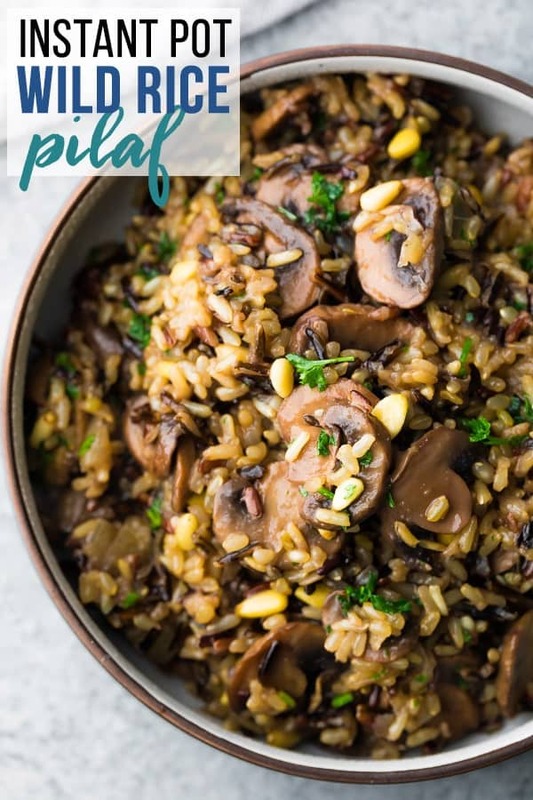 Instant Pot wild rice pilaf with mushrooms and pine nuts- this is the perfect low-effort side dish for your holiday table! Cook it ahead in the Instant Pot and re-warm when you're ready to serve. Select 'sautee' function on a 6 quart Instant Pot. Heat olive oil, then add the onions and cook for 5-7 minutes, until soft and translucent. Stir in the garlic and cook for one minute. Add 1/4 cup of white wine (or stock) and deglaze the Instant Pot for 1-2 minutes. Cancel the 'sautee' function and add remaining ingredients. Stir everything up. Cook on high pressure for 28 minutes, then allow to naturally release for 15 minutes. If there is any pressure remaining, release it. Stir in the parsley and pine nuts and enjoy. Add pilaf to a casserole dish with a lid. Bake (covered) for 30 minutes, or until heated through. Stir in the pine nuts and parsley just before serving. 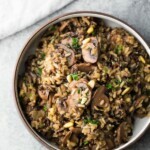 *This recipe has only been tested in a 6 quart Instant Pot *This recipe was tested with two different brands of wild rice blend: a brown rice blend and a brown basmati blend. Make sure not to use parboiled (pre-cooked) rice. Cook time was adapted from Green Healthy Cooking! Made this for company this past weekend. Wow, it is delicious. I used mushroom broth but that was the only change. Very easy and delicious. Thank you for sharing! Is there anyway to add chicken to this to make it a fuller meal for lunch prep? Has anyone tried this in a slow cooker? If so, what changes did you need to make to the recipe? Hi Elizabeth! I haven’t tried, I have actually heard rice gets quite mushy in the slow cooker. But if someone has had luck I hope they can chime in! Can this be made as stuffing for a turkey? If so, do you suggest less liquid or less cooking time since it will continue cooking inside the bird? Can you share what brand wild rice you used? Wow this looks so good! I just bought an Insta Pot! Can’t wait to try this??. This recipe sounds great and I’m totally in love with my Instant Pot. Any chance you can provide stovetop instructions? I don’t have an Instant Pot, but this looks delicious! Hi Jennifer! I haven’t tried this, but I would follow the directions for this recipe, except adding as much stock as your rice package calls for. I can’t remember the ratio for wild rice. Might be 2:1? Then cook for whatever time the package says. Some say 20 min and some say 45, it seems to depend on the blend. Good luck and I hope you enjoy it!